A concept central to Jeung San Do’s cosmology. The Cosmic Year is a grand cosmological cycle spanning 129,600 earth years. The cycle of cosmic year is the essence of truth; the basis of truth. 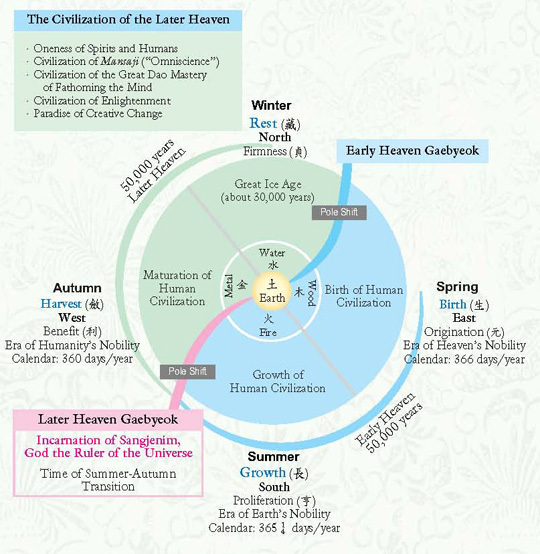 When the celestial realm of the universe completes a full circle, the cycle constitutes a cosmic year. Just as a calendar year entails 129,600 degrees, a cosmic year spans 129,600 calendar years. A grand cosmological cycle spanning 129,600 earth years. The precept of the cosmic year was first fully explained to humanity by His Holiness the Taesang Jongdosanim, who, in 1946, first diagramed the cosmic year cycle, contextualizing the birth, growth, and maturation of human civilization. Just as life is born, nurtured, and harvested within the cycle of an earth year, human civilization undertakes a similar journey toward spiritual and material fruition within the cosmic year. The cosmic year spans four cosmic seasons: spring and summer (the Early Heaven), and autumn and winter (the Later Heaven). Human civilization arises in the cosmic spring, flourishes in the cosmic summer, and attains maturation in the cosmic autumn. The cosmic winter is a period of rest.